This gives an indication on the type of cellaring that I have used. It allows to put in each box the length of two bottles, and in width, to store two cases of 12 bottles. 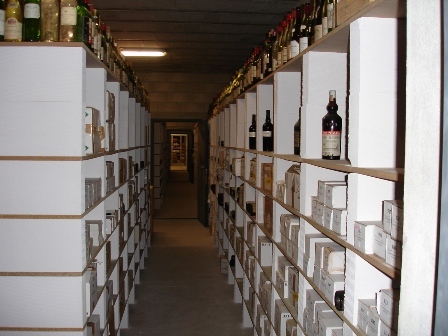 The upper part of the storage is higher, in order to store vertically the alcohols. On the top, there are all the empty bottles that were drunk during lunches and dinners. Many bottles are still wrapped, to protect the wines from light. Cette entrée a été publiée dans billets et commentaires le 6 décembre 2006 par François Audouze.